Technology has opened a whole new door for writing. Not only is it more time suitable, but it is also much more easy to write, publish, and become noticed. Writing started as a delicacy. Few people knew how to write, and when someone wanted something to be written, big bucks were paid to do so. It amazes me how far writing and the technological advances involved with writing have come. Even in this century, authors would spend years and years writing a book. It would have to go to an editor, a publisher, a distributor, and then finally to the stores. Now all writers have to do (if they don’t want to send it to an editor) is click “Submit” and there their piece will be, in all its glory on a webpage. J. D. Bolter, a chair director at the Georgia Institute of Technology, has work published on technology and computer science. In his book, Writing Space: Computers, Hypertext, and the Remediation of Print, Bolter states “the shift to the computer may make writing more flexible, but it also threatens the definition of good writing and careful reading that have developed in association with the technique of printing” (4). This brings up a valid argument. It is a proven fact when articles are on the computer, more people will skim through them, but when people have a physical paper copy in their hands, they will read it more thoroughly than they would reading on the computer screen. This is likely to happen because looking at the computer screen can be an eyesore. Unless an article is written in lists, there are bolded font, or the sentences are real short and to the point, people are going to breeze through a reading, not giving it the careful concentration it may need. Bolter also brings to point that now, there are much more than words to reading. Reading an article with just words is now considered boring. 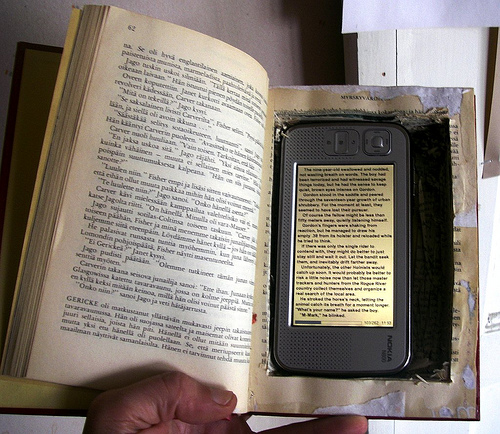 Visual and digital technologies are what entice the reader. Print now comes in many forms such as photographs, films, and televisions (26). Bolter explains “the best way to understand electronic writing today is to see it as the remediation of printed text…” (26). Bolter is saying that computerized print is much more basic than the printed text. This can be true in many ways. First, printed text can be hard to read, depending on the person who is writing. Normally, word processers take away that issue with having many clear fonts to select from. Printed text may also seem remedial because of the time difference. Writing out text is more time consuming than simply typing it up. There are many benefits to the technological advances of writing. Though many people may be bitter to the fact that not many people use books anymore, they have to accept that this is what is happening. Hopefully sooner or later these people will find some sort of pleasing aspect to digital literacy, like the rest of us have.